Mmmmm.. blueberry cobbler. There’s nothing better than a warm, gooey bite of sweet, juicy blueberries with buttery nuts and oats. Unless it’s a raw vegan blueberry cobbler smoothie made with whole, natural ingredients with no animal products or refined sugar! Can you tell I love sweets? Every smoothie I make is inspired by dessert and I wouldn’t have it any other way. But who says dessert has to be a once in a while indulgence? With this mouthwatering blueberry cobbler smoothie, you can satisfy your sweet tooth while powering your body with whole foods and plenty of antioxidants. Did I mention it’s raw AND vegan?! Blend all ingredients except the granola for 2 minutes. If you have time, soak the oats in the almond milk for 10 minutes before adding the remaining ingredients. Top with a few blueberries and 1 tbs granola. 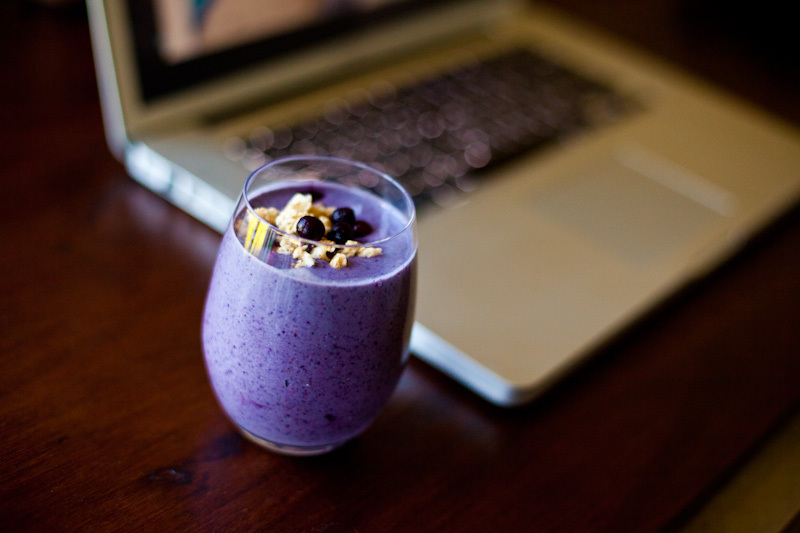 Then sit down and savor your smoothie with a big, fat smile on your face. You’re having dessert for breakfast and no one can stop you!! *To make raw almond milk, blend 1 tbs raw almonds with 1 3/4 cup water. No need to strain.